Every bachelorette party needs great products to be a sure fire success. But all of the options make the choices overwhelming. This Week’s Top 5 Featured Products are fabulous items that are sure to help your party be a stress-free success! All of these products are available on our site, along with many more that will easily coordinate with any theme. 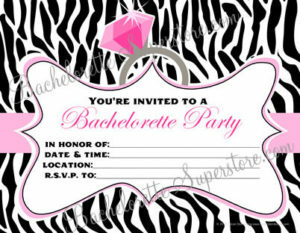 There are a number of great invitations that can be purchased and customized, but one of our best sellers is the Bachelorette Party Zebra Stripe Invite. These invitations are a little classy and a little sassy, making them ideal regardless of the party theme! It was hard to highlight just one decoration. It’s very easy to get distracted by all the choices and possible combinations! We chose the Bridal Bash Confetti for its versatility. This decoration can be used in so many ways to add some sparkle to any bachelorette bash! Sprinkle some in the invitations and on each table top. For an extra ‘Pop’ of fun, put some of this confetti inside balloons and burst them during the party, letting the confetti rain down. A new favorite here at Bachelorette Superstore are the Male Stripper Straws! These straws are a ton of fun, and will make your guests blush and giggle! Best of all, these reusable straws make a perfect party favor for your guests. No matter what the party plan is, a game is a must-have, even if it’s just a backup. Parties rarely go exactly as planned, and being prepared to help fill some downtime or add a spark of fun will give you peace of mind and some stress relief. 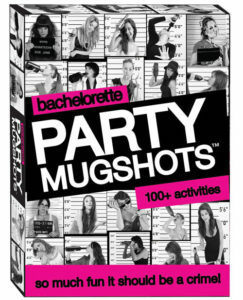 Our Party Mugshots Game is the perfect choice! This game can be added at any point of a party to provide comic relief while creating lasting memories for the guests and Bride-to-Be! 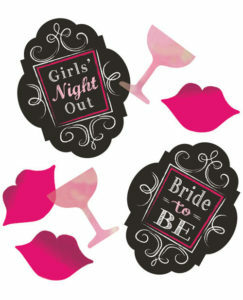 Every Bachelorette wants to feel special and stand out on her ‘last night out’. What’s so great about our White Bachelorette Flashing Sash is that regardless of party theme or location, the bride-to-be will shine throughout the night! While party planning can be stressful and overwhelming at times, our blog posts and website offer great resources to help. This Week’s Top 5 Featured Products are just a few items that will add to your party success regardless of theme or location. Stay tuned for future Top 5 features. This entry was posted in Bachelorette Cocktail Supplies, Bachelorette Decorations, Bachelorette favors, Bachelorette Games, Bachelorette Party, Bachelorette Party Accessories, Bachelorette Party Favors, bachelorette party games, Bachelorette Party Planning, Bachelorette Party Supplies, invitations, Party Planning on April 6, 2017 by Tiffany Freitag.